If you’ve not made a New Year’s resolution yet, here’s a belated one: take a walk round Edinburgh this year on 25 December. Christmas Day is the only one you can amble round our majestic city and recall, or imagine, what life was like when the shops closed on a Sunday. It’s a truly peaceful day with only a few tourists out and about, who you can terrify by offering to take a photo of them both on their camera, then delight them by not stealing it. ‘The Lord’s Day’ in Edinburgh was once a day of rest but where can you venture for that now? Stockbridge and Bruntsfield, once sleepy Sunday villages, now bustle with gift shops and markets. And whilst weekend markets in Edinburgh are an enjoyable experience they hardly remain true to local shopping. What about the deli, butcher, fishmonger, et al, who trade six or seven days a week? Not so woke when you think about it. I was yearning for some peace and quiet and a relaxed afternoon. Strolling through the West End of Edinburgh on my way to Otro Restaurant on Coates Crescent I thought there might be something missing. And indeed there was! No people, bustle, business or shops. It was like the days of my youth. By the time I stepped through Otro’s chic and glamorous entrance I was so relaxed as to be metaphorically horizontal. I dined with my good chum Stella, who is also a relaxing presence. Stella is ridiculously ‘cool’ but also a caring and delightful person, not a usual combination. 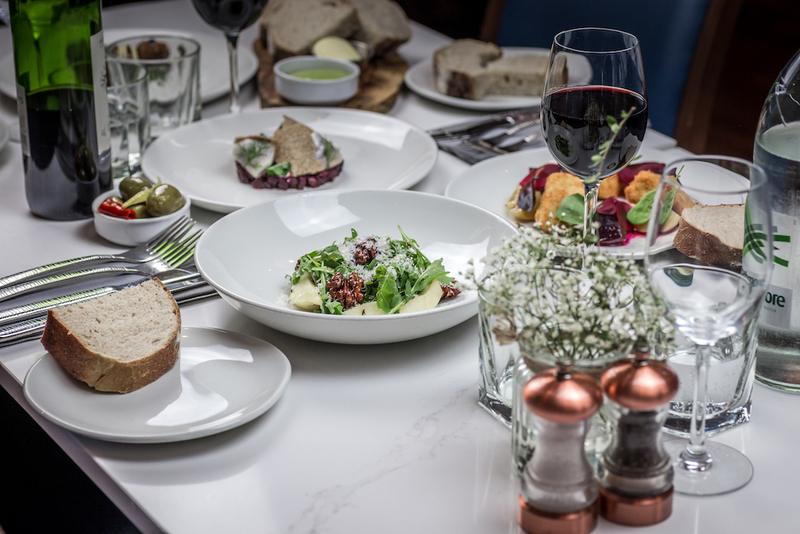 We settle in for the afternoon with a glass of Prosecco, Sourdough Bread, Herb Oil and Gordal Olives. This is the entirety of what I’d usually manage for lunch so I pace myself. The herb dip is zingy and fresh and the olives plump and juicy. We move on to a fine Sauvignon Blanc for me and a Bloody Mary for Stella. I always envy people who can rock a Bloody Mary, it seems to be a groovy thing to like, but I can’t do tomato juice. Stella deems it to be delicious though, and she’s the cool one so she’d know about such things. As per, I have pre-empted my visit with a quick online scan of the menu. There’s another thing you couldn’t do in ye good ol’ days. You had to turn up and hope for the best. I’m rather excited because on Otro’s online sample menu Argentinian Wild Prawns and Isle of Wight Tomatoes are mentioned. What’s so special about an Argentinian Wild Prawn you may ask? Is it livid? Nope: according to the internet(s) it is very sustainable and quite tasty. Apparently the Chinese love ‘em. On to the Isle of Wight Tomatoes. They‘re the best in Britain, according to the Isle of Wight Tourist Board, well they would say that wouldn’t they? However as the Isle of Wight is the sunniest place in Britain, they maybe have a point. I once spent a summer of my youth there, starring in a rather naff children’s television programme, and not once to my recollection did I try a native tomato. Talk about an opportunity missed. This menu bias also seems rather unfair on the broad beans, say? They could be from Pontefract and constantly being upstaged by liquorice. Like the perhaps Lanarkshire peas or Melrose turnips, they wouldn’t have minded their moment in the limelight. Alas today’s menu features neither South American prawns or island tomatoes but that’s reassuring, as I like one that changes with the whims and fancies of the kitchen. Stella opts for the Shetland Mussels with a Bourbon and Paprika Sauce, served in a precious little pot, and I, peaked my the lack of fancy tomatoes, go for the oddest sounding starter on the menu: Cockburn Haggis with a Fried Egg, Pickled Turnip and Truffle Granola. It sounds awful but turns out to be an utter delight. 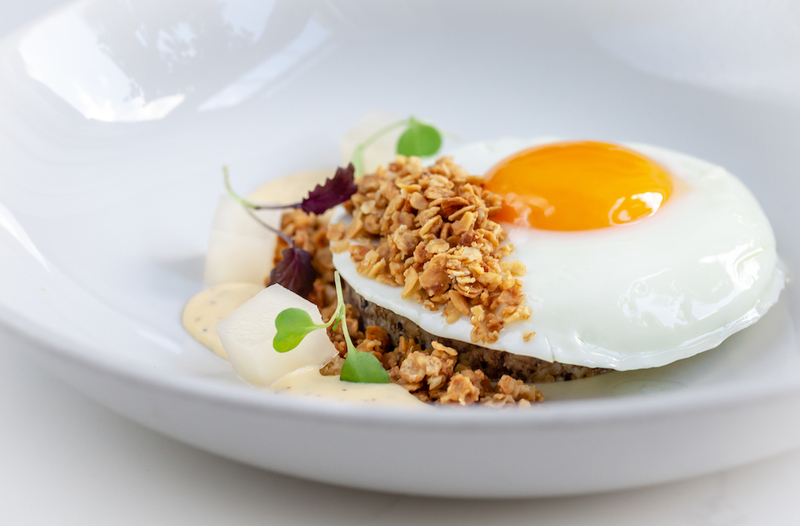 The dainty cubes of pickled turnip add a welcoming tartness to the richness of the haggis and egg and the granola a crunchy contrast to the smoothness of the stars of the plate. The mussels are fat and well seasoned. Although determined to save ourselves for the main event we both clean up. The service is great here. The dining room is not commanded but ‘cared for’ by three charming ladies. Are we allowed to refer to female waiting staff as ‘charming’ these days? No matter, it’s true. 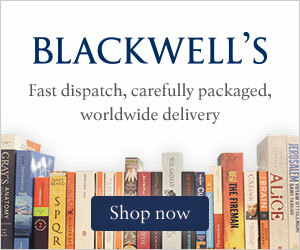 Smiley and delightful, everything arrives as it ought to, in a nice relaxed manner. 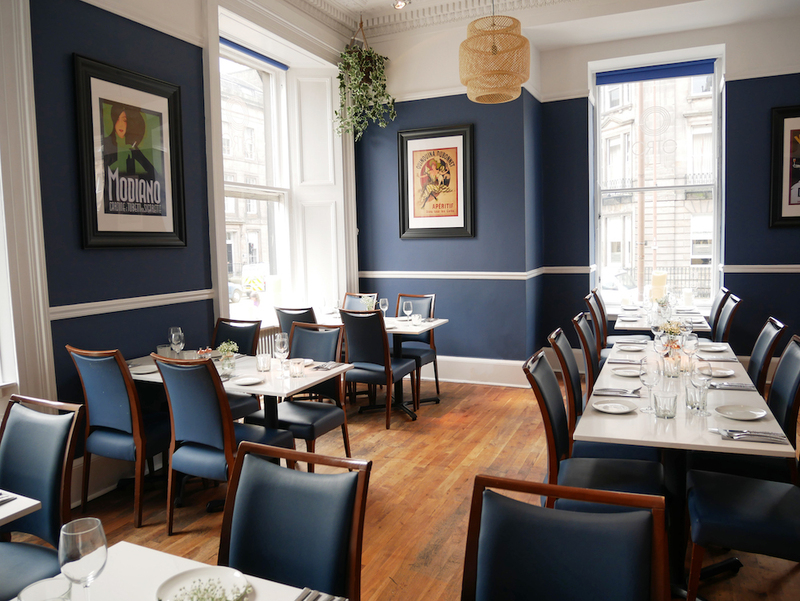 The blue and elegant, bistro style dining room is happy, in no small part to the nice young women encouraging the merry diners to enjoy themselves. 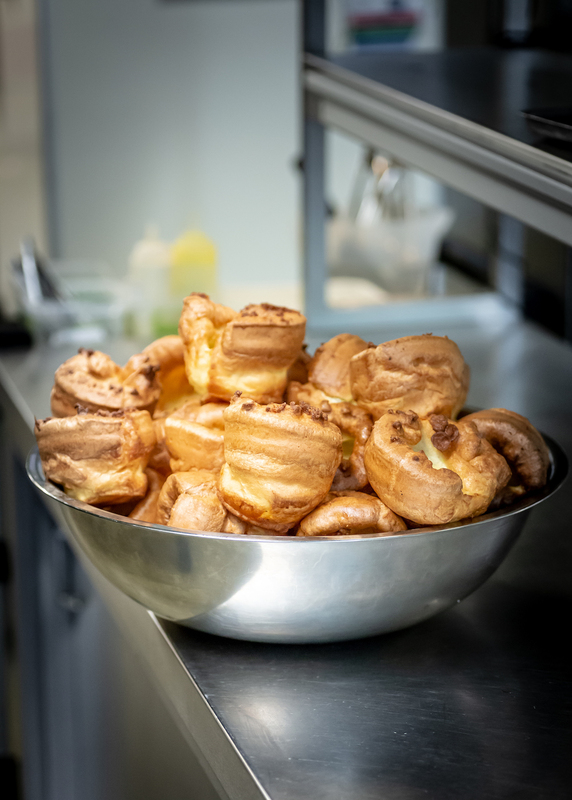 Roast beef and Yorkshire pudding…. For main course I opt for the traditional Beef Roast with Yorkshire Pudding, Duck Fat Roast Potatoes and Seasonal Veg, whereas Stella goes leftfield with a Lamb Shank, Curried Chickpeas and Burnt Aubergine Raita. On many menus there’s an example of a dish where a chef tries to be too damn clever and I wondered if this lamb shank abomination could be it? However, it does work well and has a delicacy of flavour I wouldn’t have expected. The lamb is cooked to utter perfection and I was very much in love with the burnt raita. My trad main was also delightful and generous. The duck roasties were crispy and creamily sublime and the kale the best I’ve ever tasted. Seriously, if you’re doubtful about kale please try this and be converted: whether it came from Cumbria or Cumbernauld, it was awesome. As is usual for me, I could have done with more gravy, I like to be swimming in the stuff. I could have asked for more but forgot to. I shall next time as it was worth drinking by the glass. A couple of hours and vinos in, Stella and I form an inevitable single women mutual appreciation society, the conversation rejoicing in our relative goddess like natures and spectacular wonderfulness. At Sunday lunch on a bright day, all seems positive. For the final fling we opt to share a Chocolate Fondant, Cherry Custard and Pistachio Ice Cream and a Yorkshire Rhubarb, Pistachio, Stem Ginger and Rose Water Pavlova. 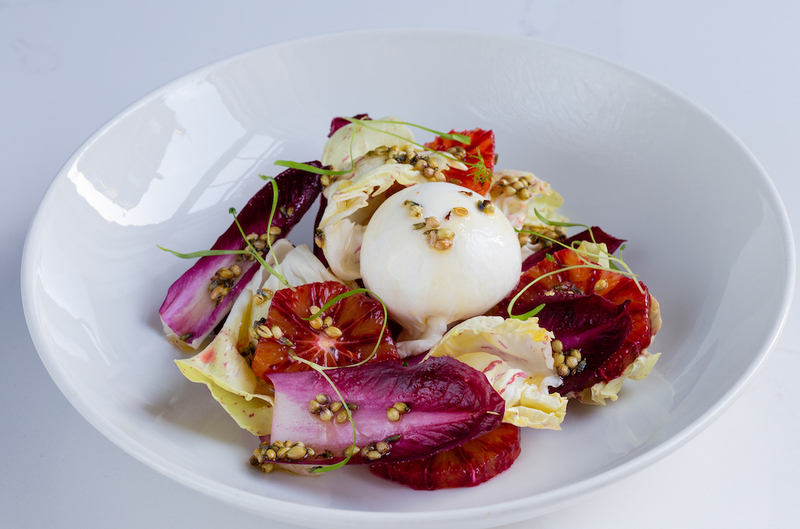 What’s so special about rhubarb from Yorkshire? It’s the only fruit with a ‘walk of fame’ check on the menu. Well I’ve Googled Yorkshire rhubarb so you don’t have to. Apparently God’s own Country has what they call a Rhubarb Triangle. Yes, really. Rhubarb is native to Siberia, just like my daughter’s new hamster (called Pudding, if you’re interested), and thrives in Yorkshire’s wet cold winters. In fact, in 2010 the EU awarded Yorkshire Forced Rhubarb a protected Destination Of Origin status. And to think so many Yorkshire people voted Brexit? Talk about ungrateful. Anyway, I’m unsure about the rose water in the Pavlova as I think such flavours taste of old lady. I’m of course referring to the old ladies of ye olden days who bathed in rose water and lavender on Sundays, such was the lack of shopping to do. I’m sure you current old ladies taste of Lagavulin and dark chocolate, or something equally splendid. However the touch is light with this dessert and I’m mighty happy to have experienced rhubarb from Yorkshire: whether you’re Brexit or Remain, the European Commission sure know a thing or two about rhubarb. Our chocolate fondant also comes from some Masonic triangle of perfection. I know not where the cocoa beans originated from, and neither do I care, but I’d roll up a trouser leg to have it again. At £19.95 for two courses or £24.95 for three I’d say this was an utter bargain of a Sunday lunch. Sides are available and bread and olives cost extra but they are not needed with this menu. With Otro’s sister restaurant being the ever popular New Chapter in Cannonmills it’s an instantly popular venue with a menu that remains innovative but always enjoyable. Wandering home we unfortunately hit the bustle of Princess Street, however our relaxing hours are not lost. A Sunday lunch like this is such a good end to the weekend. Daytime libation makes for an early night and a fresh start to the working week. Of course back in the day if you worked for John Lewis you’d be having the Monday off too. Unthinkable now, isn’t it?